After an hour with CKNW’s mid-morning talk show, I conclude that it provides misinformation more pervasive than does a jock-sniffing sports call-in show. Unfortunately, Corus Radio has a province wide stage for its garbage. So Bill Good began the process of holding Christy Clark to account. He did so by inviting Suzanne Anton, mayoral candidate for the BC Liberal farm team, on air to criticize Mayor Gregor Robertson for delays in prosecuting the rioters. “Surely some of those people could be fast-tracked for intense investigation,” offered Good, apparently unconcerned about politicians interfering directly with police services. Anton reported that after the London riots, British Prime Minister Cameron pulled everyone back from holidays and had a full day’s debate in the national Parliament. I assume Anton thinks Mayor Robertson should have done the same. Normally, magistrates go about their business without attracting much attention. Even though these unpaid, legally unqualified volunteers deal with more than 90 per cent of the country’s criminal cases, their only reward is a sense of doing something worthwhile for the community. Although much of the judicial work has been handled by professional district judges, JPs have been exceptionally busy. …the whole point of the magistracy is that it provides local justice, administered by local people. Contrary to the information offered on CKNW, the legal systems are quite different and I think that, largely, the Canadian differences are defensible. Do we want unpaid, legally unqualified volunteers dealing with more than 90 per cent of the country’s criminal cases? I don’t. However, I would like to see fundamental problems with BC courts addressed and a different response than the British “whack ’em and bash ’em” approach to antisocial behavior. Problems in our criminal justice system were evident well before the June 15 outbreak of violence after a hockey game. Moving more quickly on Stanley Cup rioters will set free impaired drivers, drug dealers and others now awaiting much delayed trials. CBC News, December 20, 2010, Crown prosecutor shortage hits B.C. There are no longer enough prosecutors to handle the legal work of convicting criminals in B.C., the head of the B.C. Crown Counsel Association is warning. Association president Samiran Lakshman says the government has stripped the criminal justice system of resources, by closing courtrooms, cutting legal aid, and failing to hire enough judges and prosecutors. “What we’ve seen is a systematic stripping of the criminal justice system, from not filling provincial court justice positions, to cutting legal aid, to stripping Crown offices of the ability to do our job,” he said. During Sunday’s debate, NDP Leader Carole James asked why, if the Liberals were dedicated to fighting crime, did the party’s budget forecast a cut in funding for corrections and prosecution services over three years? 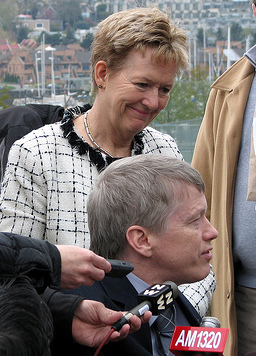 Clark has been criticized for appearing to govern by photoop. Her brash call for swift justice in the wake of the Stanley Cup riot now looks opportunistic and in fact simply highlights the problems of a clogged court system that suffers from, among other things, lack of funding from her government. Yes indeed, the Anton(attack Gregor segment) eer, I mean interview…. A couple of little points Ms Anton failed to mention.. The Province does have such control, they have the power to hire appropriate staff, make judges and court space available…It was a sad hatchet job by Anton and Billy Good was only so will to play along. The BC judicial system is so corrupt. I can see the kids of the elite involved, in the Stanley cup riot, getting off scot free. In England right now, there are two M.P's doing time for theft and corruption. In Canada, corrupt politicians or the elite, only need to have a special prosecutor. Corrupt politicians, like Gordon Campbell are rewarded, by our P.M. for doing his dirty work for him. Canada is now, a very corrupt country. That's why there is a two tiered judicial system. One for corrupt thieving politicians and the elite. The other system is for the average joe.